Manufacturer of a wide range of products which include steel spring, stainless steel spring and carbon steel springs. Offered in the market at the most reasonable rate possible, the range of Steel Spring provided by us, is widely acclaimed and asked for. Manufacturing of this range is commenced utilizing the finest raw materials and advanced machinery, to maintain the product’s sturdiness, dimensional accuracy, durability and resistance to corrosion. In order to provide the finest range of Stainless Steel Spring to our clients, we engage in the utilizing the high grade raw materials and modern machinery, as per the set norms and guidelines of the industry. This helps us ensure the product’s finishing, durability and resistance to corrosion and standardizes the product’s standard of quality. We also present an exclusive range of Carbon Steel Springs to our clients. 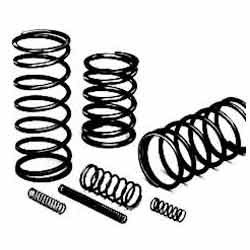 These springs are developed under the strict supervision of our experienced professionals. Our products are highly acknowledged for their optimum performance and are capable to meet various application requirements. 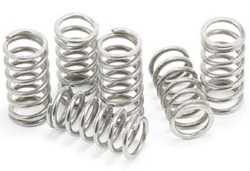 Looking for Steel Spring ?